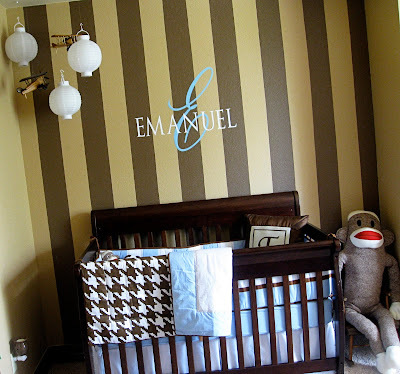 Thank you so much for all of the sweet comments on the nursery! I really did enjoy putting it together, and absolutely couldn't have done it without the help of my amazing and incredibly talented mother! 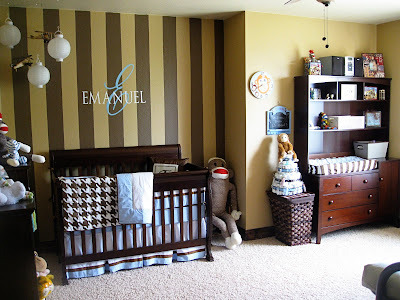 So here are some more details about the nursery, including answers to questions I received in the comments or via email. 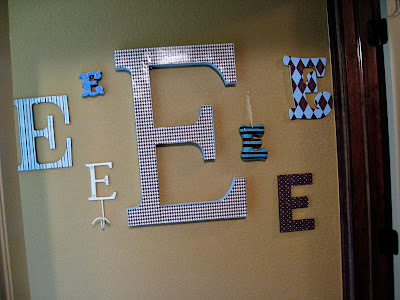 Entryway of E's - this idea was inspired by Brittany from Perfect Harmony. 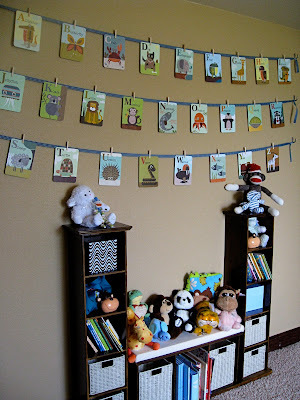 She did a collection of H's on a shelf and I just loved the different sizes and shapes, and knew I wanted to do this somewhere in my house. The big E in the center is from JoAnn Fabrics and was only $2! It was plain cardboard and my mom mod podged paper on it. The horizontal striped E was a gift from my little sister, and I think is from Kirkland's. 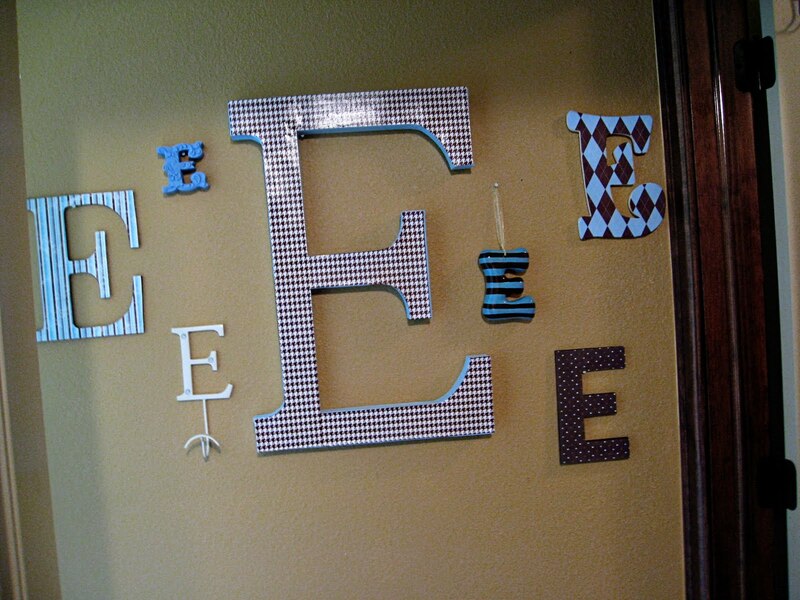 The rest of the E's came from Hobby Lobby, all during 50% off sales. I modge podged scrapbook paper on 3 of them (stripes, argyle, and polka dots), the white one was like that when I bought it, and the small blue one was black - I just painted it with craft paint. Alphabet Cards - My friend Ashley introduced me to these and I knew I had to have them the minute I saw them! They are by K & Company, and they used to be sold in stores at Michael's for around $7. I haven't seen them in stores in awhile, but you can order them online several places. I got mine on ebay from this seller and the total was around $10, including shipping. 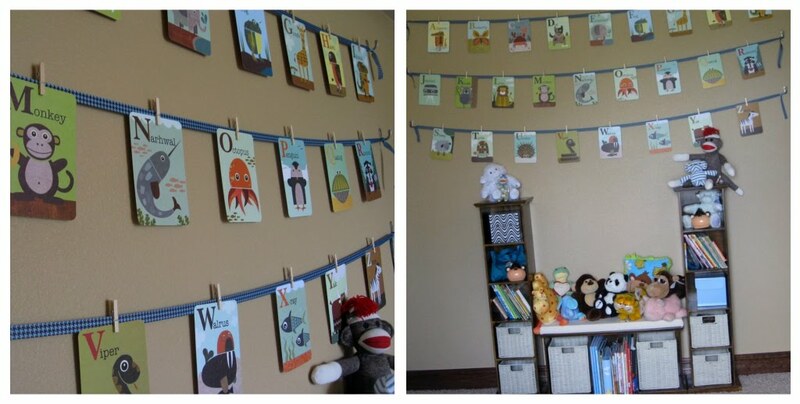 Then we just strung them on ribbon using miniature clothespins from Michael's. You also might remember the bookshelves from the tour of my old classroom. My mom re-finished these & stained them to match the rest of the furniture - I love how they turned out! Airplane Mobile - The lanterns are battery operated and I actually randomly found them at Wal-Mart in the wedding decoration section. It was $10 for the set of 3. The airplanes are from Kirkland's. Patrick hung these using fishing line. Wall - My mom & Patrick painted the stripes, and they are 6 inches thick. We just measured the wall & then determined how big we wanted the stripes from there. His name & the E are not painted on - they are vinyl and I cut them with my Cricut. The picture on the far right is a nightlight I made. I'm working on a tutorial for those and will share soon. Wall Decorations: The alphabet picture in the middle is Amy Coe but I got it at TJ Maxx for $7. The 3 little animals at the top were a Martha Stewart frame kit. I think I've seen them at Michael's, but I got mine at Big Lots for $2. The other frames were gifts. Further to the right is a growth chart that my friend Daysha gave to me - such a unique gift - I love it! I love everything...so cute. 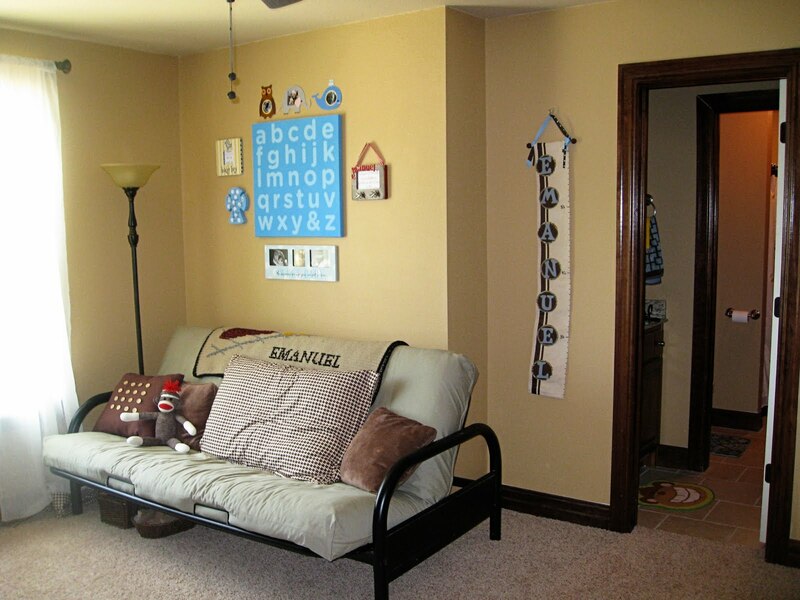 Can't wait to see pics of your sweet boy in his room. So many cute details! It's just perfect. And, I just saw your ticker - 6 days left -ahhhh!!! E will be here soon!! You have done a fabulous job! 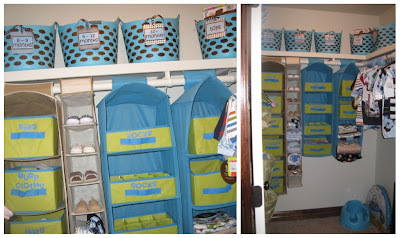 I still smile when I look around my son's room and think of all of the creativity and hard work that went into it! I have got to figure out how to do those stickers on my cricut! I was always too afraid they would look cheesy, but that looks like something your ordered! So cute! Fabulous! I love the E wall. You did such a wonderful job! Wow! 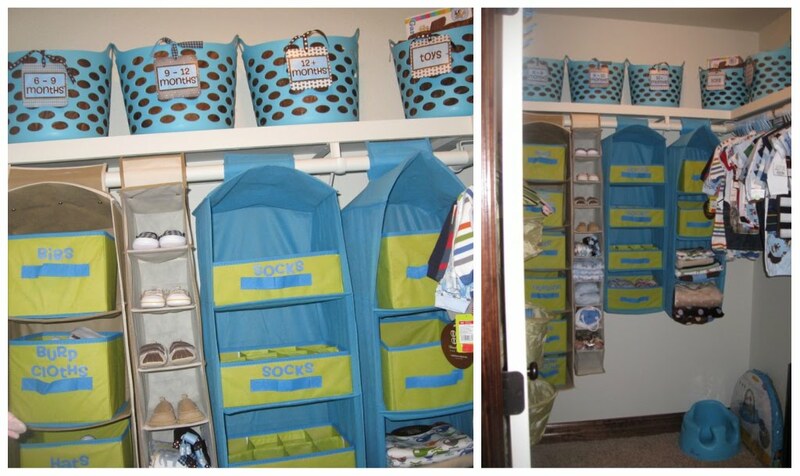 It sounds bad to say that you're "crafty," but you know what I mean ;) You're an expert! Love, LoVe, LOVE it all. It definitely needs to be featured somewhere...have you submited photos to any decorating blogs yet? 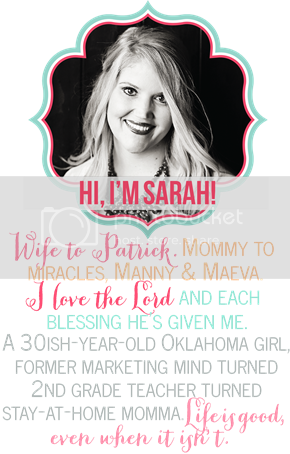 You are so good, Sarah! Love,Love,Love it all. Where did you get the bedding?